Some countries, I am thinking mainly of Russia during the reign of Catherine the Great (1762-1796), missed out totally on the Renaissance, leaping from a feudal society into the Enlightenment in one bound. Much of the art in between was insignificant or a variation on the icon art of Andrei Rublev, for example, which Russia should be rightly proud of. The icon and that sense of folklore religiosity, plus the Eastern or Orientalist sense of the exotic and mysterious continued to influence Russian art afterwards, But it was balanced by Western influences, and sometimes overwhelmed by them. Many Russian artists up until and even after the revolution, were either of foreign extraction or spent a great deal of time in cultural centres like Paris and Rome. One can see this clearly when we put a Russian impressionist work alongside a French one. Internationalism has a long history indeed. Nevertheless, the Russian character, if we can talk of that in a post-postmodernist context, is evident in the oeuvre of the finest Russian artists of the nineteenth century. Indeed many formed a coalition against Western influences, aiming to capture the realism of the countryside and its people. 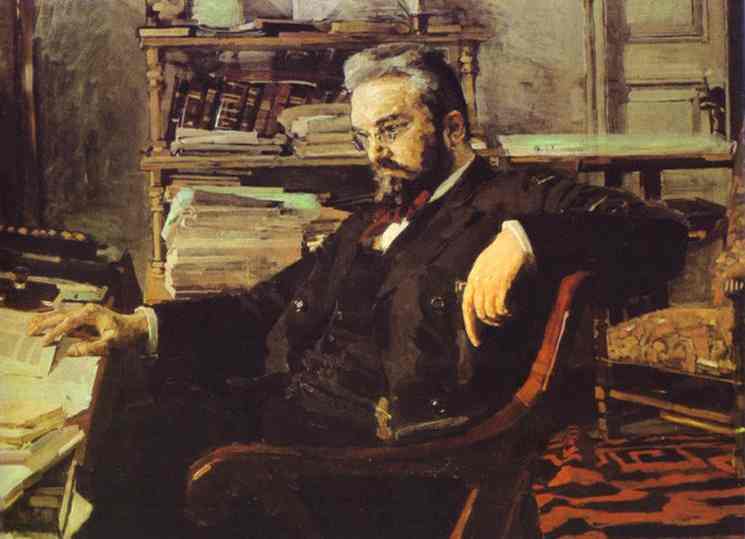 One artist, who played with the dialectic of the Slavophile and the melancholic tendency against Western influence, was Mikhail Vrubel (1856-1910). His art is simply extraordinary, and will take you, like the greatest Russian literature, to depths that both educate and endanger your sensibility. His Seated Demon for example has in its colour psychology and the posture of the central character something unsettling. The figure is not so demonic, it could be you or the artist, and yet there is a madness in the composition which is difficult to define. There is an unresolved tension in the muscular torso and the feminine sculpted face. The same is evident in the colour diction. Vrubel’s Seated Demon, shown above, seems to be grounded in a deep, melancholy that knows no cure. In the 1870’s, Vrubel saw an opera by Anton Rubenstein based on Mikhail Lermontov’s poem Demon. Both the opera and especially the poem literally intoxicated him. In the poem, Satan, the fallen angel based on a Byronic romantic figure (Cain), bored and looking for a revenge against God chooses to destroy a Prince who is about to marry the beautiful Tamara. After accomplishing this, he goes to see her, and falls deeply in love with her, so much so that he is willing to give up all his bad ways if she would only love him. Charmed and almost his, Tamara resists, and dies shortly afterwards. Her death finishes the Demon’s possibility of going to Heaven; she on the other hand is taken there by angels. 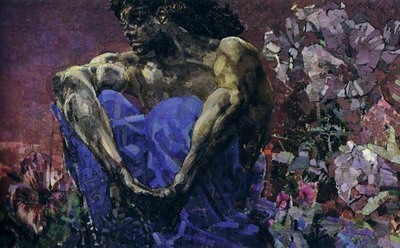 There are many sources for the Demon in Russian symbolist art and literature, but in this instance, Vrubel saw the Demon as the artist and himself, a battle within where creativity and perhaps lust battle. It is interesting that his Demons are often androgynous, perhaps signaling a battle with his own sexuality. 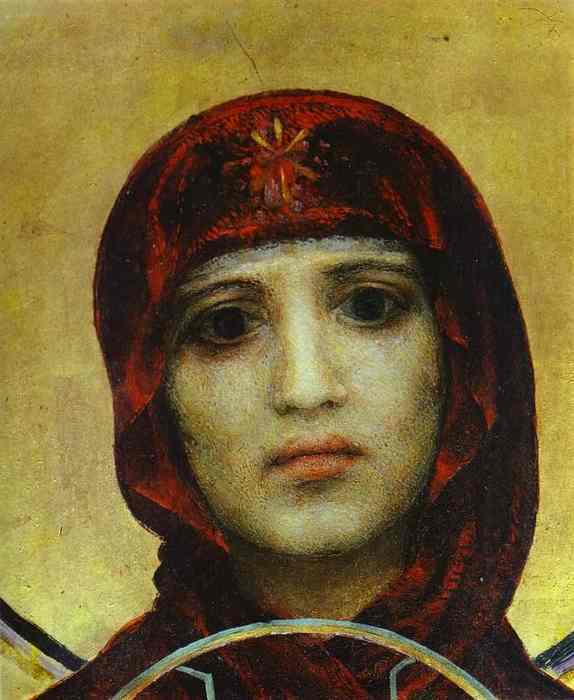 We see this in the earlier head of the Virgin, a detail from “The Virgin and Child” (1884-85). She looks inside herself. It expresses a sad quality that unnerves us. As a symbolist head she has the pale remoteness found in Belgian and French symbolist art, like the women of Fernand Khnopff (1858-1921). She is certainly far removed from the two dimensional flat Virgins of traditional icon art. She is also different from the academic version of William-Adolphe Bouguereau (1825-1905). What attracts one to Vrubel is the breadth of his talent. 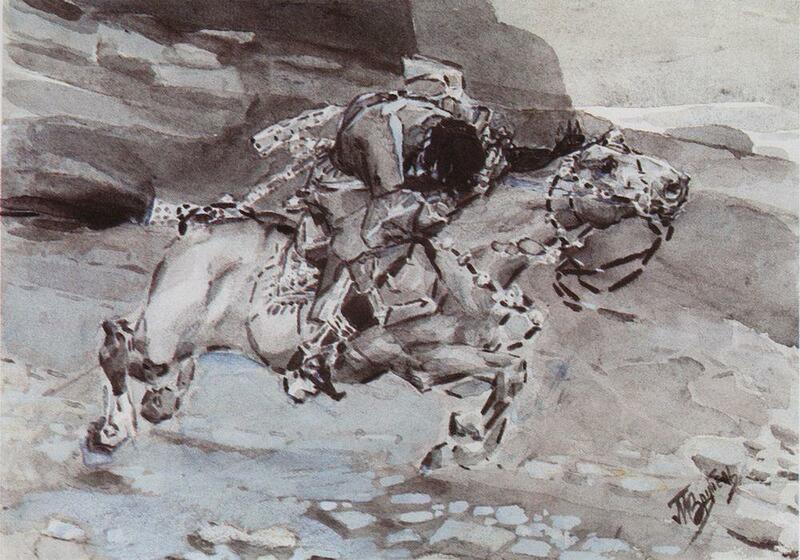 The illustration below, done for an edition of Lermontov’s Demon (1890-1) captures the speed and very life of rider and horse with such intensity that it compares well with the best works of that genre. 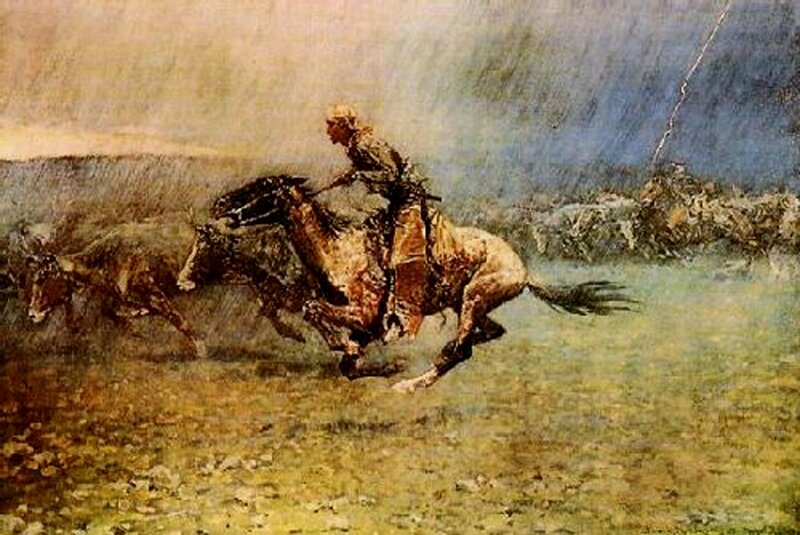 I am thinking of the Western artist Frederic Remington, an example of whose work is shown below. Like many artists, Vrubel had to earn his bread and butter and this inevitably meant commission work for rich business people or aristocrats. 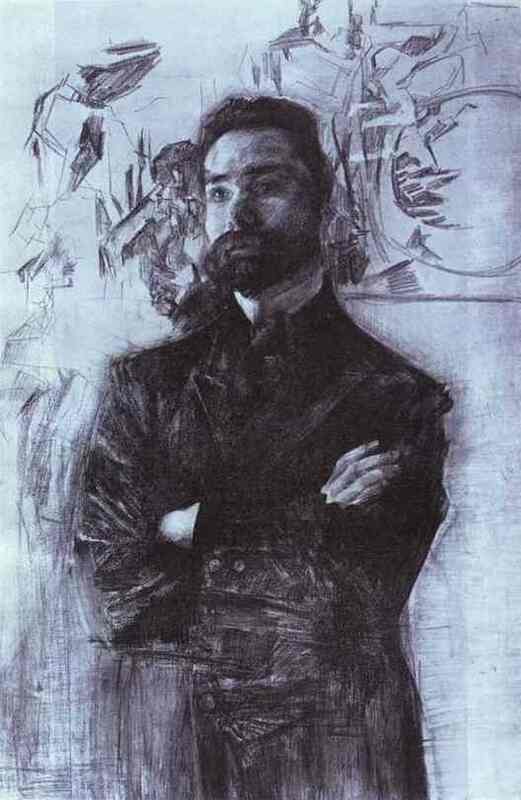 In the portrait of Konstantin Artsybushev below, Vrubel proves that he can match the French portrait painters. The painting has some of the decorative touches that we find in his illustrations for the folk and fairy worlds. But it is a somber portrait that fulfills its function of showing off the sitter as powerful, indicated by his left arm, which takes up a lot of space. It also depicts a man who is reflective, shown by the bookshelf behind him and the open book he is reading. Compare this with the portrait of the poet Valery Bryusov (1873-1924) who was executed in 1906, towards the end of Vrubel’s own short life, tragically terminated by syphilis. Here we have a veritable poet: we are drawn towards his eyes, staring into a domain that we feel must be otherworldly or one of great creativity. As we are taken into the personality, we notice also that the work does not try to convince us that he is separate from the work of art he is standing in front of. It is a brilliant sketch with other figures jostling ready to emerge, but who never will. Vrubel’s favourite subject and one who he posed in several guises, was his wife, Nadezhda Zabela, an opera singer. 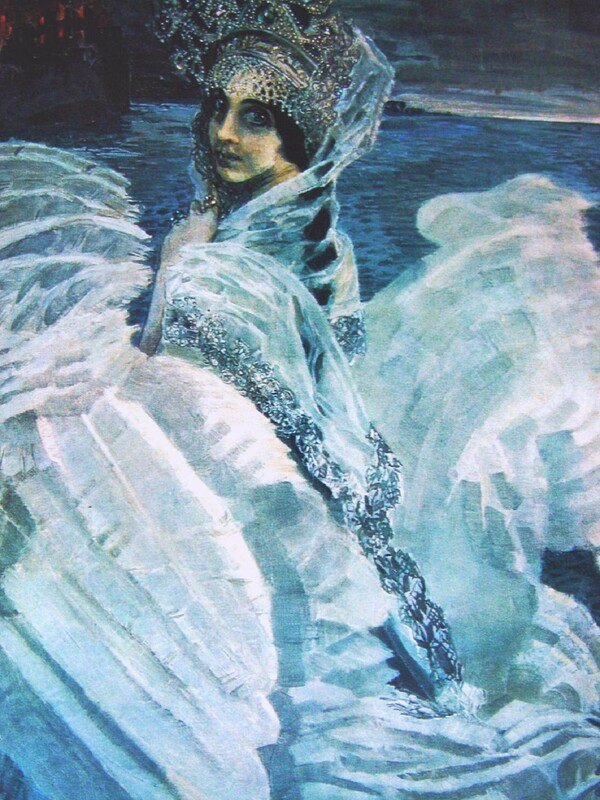 She was his ‘Swan Princess’, belonging to both the domestic and symbolic worlds, which he inhabited throughout his life, where people dressed up as fairies and characters from myths, a dramatisation that reached its apotheosis in Russian ballet and opera. Here is his darling wife as the Swan Princess, and below that, in front of a birch wood in 1904. This work has a strange modelling that reminds one very much of James Ensor and his gallery of grotesques. Yet, the painting, and the stippling of the beech trees, the colour fields, everything about it has qualities that signal Vrubel’s art throughout: the sharp lines of the top contrasting with the flowers, the pensive eyes; in short, the very design of it. The influence of Japanese prints is evident from the elongation of the background. This is the pleasure of looking, of going beyond the tyranny of art history, and finding something that – in compositional terms – is quite extraordinary, but that might easily be overlooked in the large State Tretyakov Gallery, where it hangs. Vrubel’s life and loves, his distinctiveness as an artist, set him aside from the various groups and movements, yet he was claimed by the younger generation of symbolists as one of their own. Alexander Blok (1880-1921) the poet, for example, almost idolised Vrubel. His life ending as it did, with him quite literally a demonic-figure, naked and mad as a consequence of his syphilis, is an ingredient one almost expects in a decadent or symbolist artist. But this was accentuated, perhaps exaggerated, by the period he lived in; a time when the fin-de-siecle Russians were trying to make sense of a world order that was changing, at the cusp of the new century, and quite literally embracing everything, past, present and future to survive, from the esoterical works of Madam Blatvatsky, to the messianic and demonic Rasputin, Nietzsche, the Russian folk religions, and the exotic in general. 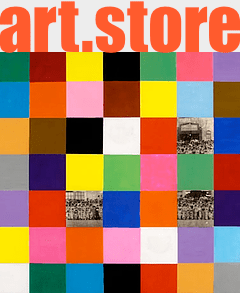 The later decades of the 19th Century, like the 1960s, were a “New Age” of artistic and social experimentation, and came at great cost. The Russian Revolution would allow the experimentation to continue, as long as it was social, formal and constructive. Unfortunately, after the New Economic Policy (1921-28), art relapsed into an ugly nationalist academic style, a taste shared by the Dictators of that time.